Jogging is a simple and flexible form of exercise that requires little in the way of special equipment or facilities. In comparison to running, jogging is gentler on your knees, hips and ankles. Jogging can help you lose weight, as you burn more calories during jogging than while sedentary. Regular night-time jogging will burn a significant number of calories. Consult your doctor before starting any new exercise regimen. To lose weight through the loss of body fat, you will need to consume fewer calories than your body uses over time. To lose a pound of body fat, you will need to create a weekly calorie deficit of 3,500 calories. Over the course of a week, this might mean increasing your aerobic activities to burn an extra 500 calories daily while consuming only 2,000 calories. A 500-calorie daily deficit would equate to a 3,500-calorie weekly deficit and a weight loss of 1 pound. The number of calories you burn on a jog depend on a number of variables including the terrain you run on, your speed and your weight. Jogging uphill or on rolling terrain will use more calories per hour than jogging on the flat, and the faster you jog the more calories you will burn. Heavier joggers burn more calories per hour than lighter joggers would at the same speed. For example, a 120-pound person burns 245 calories per hour when jogging on level ground at 4 mph. A 220-pound person, on the same terrain and at the same speed, burns 450 calories. Jogging late at night has safety disadvantages over daytime jogging, but also certain distinct benefits. In terms of scheduling, running late at night allows you unrestricted time between the end of a typical work day and your bedtime. Jogging for weight loss works best when worked into your daily routine at a consistent time, and you may have more availability to jog at night than in the mornings before the day's commitments. 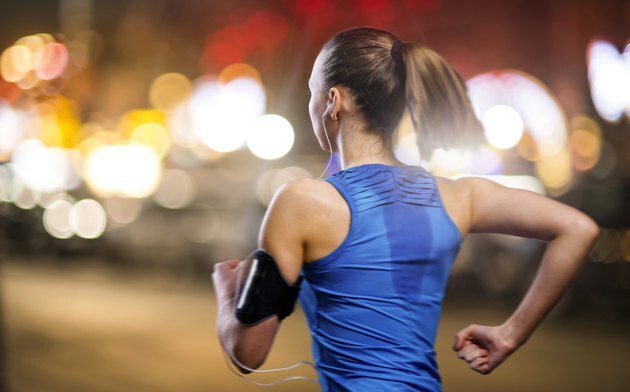 In hot climates, night-time temperatures are more favorable for jogging, and you will avoid the risks of sunburn or heatstroke associated with running during daylight. The biggest disadvantages to jogging late at night are safety-related. The danger to joggers from traffic, and from other people, are greater late at night than during the day. Make sure drivers can see you by wearing headlights, reflective clothing and other small lights attached to your body when you run in the dark. Avoid desolate or poorly lit urban areas, and consider carrying a whistle or pepper spray for use if attacked by another person. Another consideration is that your energy levels will likely be boosted for several hours following a jog -- if you jog shortly before your bedtime you may have trouble getting to sleep.